Maine House Approves Bill Requiring Marijuana Be Tested for Safety . The House on Thursday overwhelmingly approved a bill that would require the state Agriculture Department to set up testing facilities for marijuana before it could be sold. This is the first bill from a special select committee of legislators charged with creating a regulatory regime for legal pot. It goes against the wishes of Gov. Paul LePage (R), who wants the Bureau of Alcoholic Beverages and Lottery Operations to be in charge of all legal marijuana regulations. US Sens. Kamala Harris, Rand Paul File Federal Bail Reform Bill . Sens. Kamala Harris (D-CA) and Rand Paul (R-KY) filed the Pretrial Integrity and Safety Act of 2017 on Thursday. The purpose of the bill is "to encourage states to reform or replace the practice of money bail, the requirement that individuals awaiting trial remain in jail unless they pay for their release." Without being able to make bail, people charged -- but not convicted -- with a crime can spend weeks or months behind bars, with devastating consequences for employment, finances, and families. The bill is not yet available on the congressional web site. South Carolina Rep Files Federal Unemployment Drug Testing Bill . US Rep. Buddy Carter (R-SC) filed a bill on Thursday that would let states screen unemployment applications for drug use and force them to undergo drug testing in some circumstances. The bill would deny unemployment benefits for 30 days to anyone testing positive for drug use, and a second positive drug test would result in a year-long ban. The bill is not yet available on the congressional website. US Lawmakers Rip Philippines Drug War Abuses . At a hearing of the Congress's Tom Lantos Human Rights Commission on Thursday, American lawmakers ripped into Philippines President Rodrigo Duterte over drug war abuses, including the killing of thousands of drug suspects, and called on President Trump to condemn Duterte -- and to rescind an invitation to visit the White House. 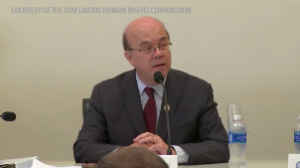 Rep. Jackie Speier (D-CA) said she was "troubled" by the invite, while Rep. Jim McGovern (D-MA) said he would "lead the protest" if Duterte shows up. "President Duterte, by all accounts, seems to not have a high regard for human rights," McGovern said. "The United States government cannot afford any degree of complicity with the kinds of human rights violations that are occurring," he said. "No other country -- I repeat that, 'no other country' -- comes to mind where people are assassinated on the streets in the name of fighting drugs, and leaders brag about it as a good thing," he added. UN Says Bolivia Coca Cultivation on the Rise . The UN Office on Drugs and Crime (UNODC) has expressed concern about what it says is a 14% increase in land under coca cultivation. "This increase is a concern for us," said UN Drugs and Crime Representative of Bolivia, Antonio De Leo. Bolivian President Evo Morales expressed regret at the report, but noted that much more illicit coca is being grown in Colombia and Peru.